It was a historical day for Japanese football. For the first time ever, Asia beat South America in a World Cup. Japan came to Russia in the most balanced group of the competition, but only as a presumed spoiler behind favourites Colombia, Poland, and even Senegal. 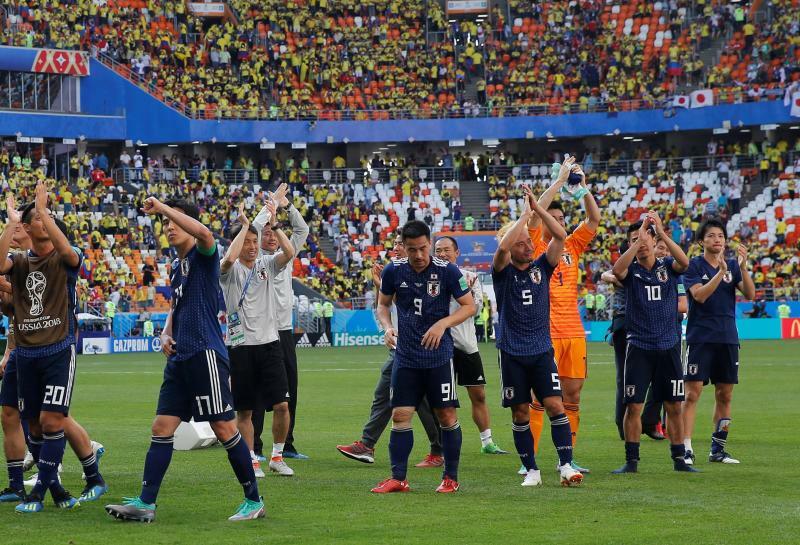 The opening match was against the same Colombia that overwhelmed Japan 4-1 in the last group stage game in 2014. However, what really counts is the final score. To the sound of Shouri no Egami wo Kimi to, Japan’s official support anthem, the scoreboard of Mordovia Arena in Saransk, displayed ‘Colombia 1 – 2 Japan’ at the end of 90 minutes. It was one of the biggest surprises of the tournament so far and a result that surpassed all expectations from Japanese supporters and media. First of all, we must stress the brilliant performance of Shinji Kagawa. Believe it or not, he was without a great outing for the national team since 2013, accumulating a series of frustrating displays wearing the Hinomaru. On Tuesday, Japan’s No. 10 finally became what everyone expects from him: the ace who decides a match. In the build-up of the first goal, it was Kagawa who set Osako free, it was Kagawa who took the rebound and had the shot blocked by Carlos Sánchez’s arm, and it was Kagawa who took the penalty. It was a risky low shot down the middle, but the Dortmund man showed enough composure to send Ospina the wrong way and guide the ball into the net. He also set up counters, created chances (which were promptly missed), and all the other work of the No. 10; Kagawa was undoubtedly the man of the match. Kagawa was criticized for disappearing in important matches, for lacking on the emotional side. He deserved to lose his place in the squad under Halilhodzic; he needed something to shake him up, to somehow help him recover the brightness of the beginning of his career and rediscover the spark lost somewhere along the way. At 29, this might be his last chance to play in a World Cup at his best form. The last chance to write his name in the history of the national team, to be remembered alongside and compared to other legends such as Kazuyoshi Miura, Hidetoshi Nakata and Shunsuke Nakamura. He recovered just in time from an injury suffered in February and started only in the last friendly against Paraguay, but one goal and two assists proved enough to cement him a starting spot over Keisuke Honda. He revived the partnership with Takashi Inui that was so successful under Levir Culpi at Cerezo Osaka from 2008 to 2010, and the two became the main hope for Japan’s success in Russia. Yuya Osaka too was under heavy criticism for his finishing, and only kept his starting position due to Okazaki’s poor fitness and Yoshinori Muto’s struggles in the No. 9 role role. The former Kashima Antlers striker, despite more lacklustre finishing, showed his worth to the team. Osako was superb in duels against the Colombian centre-backs, and his post play led to the corner that originated the second goal, which he scored on a header after winning the aerial duel with Santiago Arias. Without the ball, he was everywhere and even managed to block a shot from James Rodríguez inside the box that otherwise would surely have been an equaliser. In his pre-match press conference, Colombia manager José Perkerman stated that the team needed “to be careful with Kagawa, Honda, Kawashima, Endo, Hasebe… the most well-known ones.” He was certainly not referring to Wataru Endo, and perhaps he didn’t realize that Yasuhito Endo is no longer in the national team picture. Gaku Shibasaki was on the pitch, delivering an inspired performance that evoked maestro Endo’s best days with the same No. 7, superb vision, and quality in the passes. The Getafe man also won his place with his performance against Paraguay, overtaking an injured Ryota Oshima and a more defensive-minded Hotaru Yamaguchi. It was a match in which almost everything went Japan’s way. James, the ace of the Cafeteros, is still not 100% physically and started on the bench. In addition, who could imagine that with only three minutes played, Japan would be gifted a penalty and a one-man advantage? Even then, the numerical difference made the match more balanced, and what could have been a massacre turned into a fast-paced and well-contested match. Colombia kept attacking despite the absence of their main defensive midfielder, as if they were playing with eleven men. 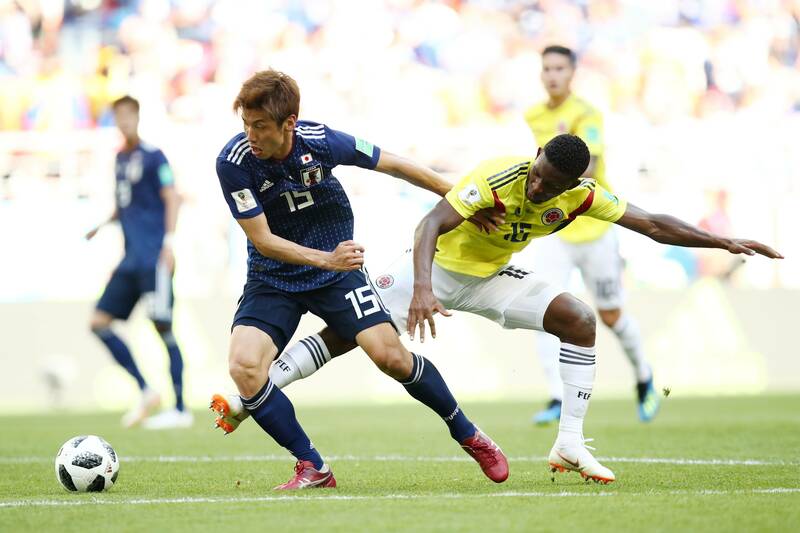 The difference is that they were totally exposed to counters, an opportunity that Japan were not able to take advantage of, especially after another volante, Wilmar Barrios, entered the field after the half hour mark in place of the right-winger Juan Cuadrado. 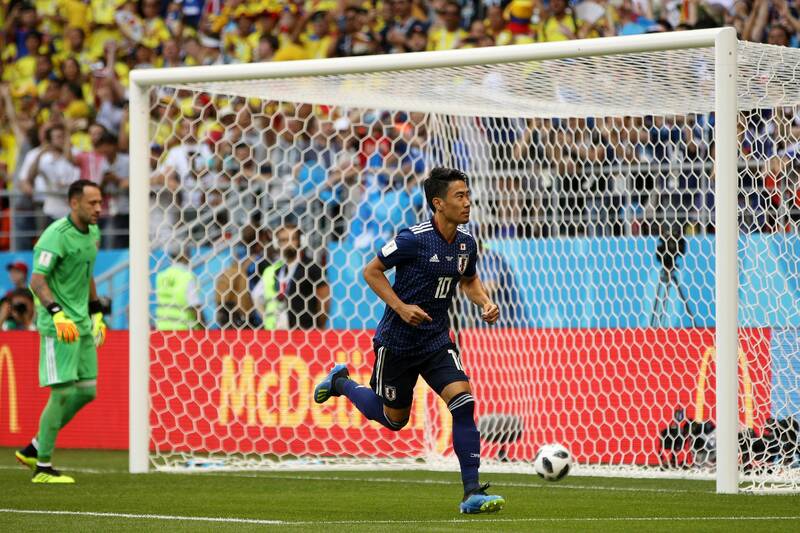 Juan Quintero, James’ replacement, did not have to occupy the void left by Sánchez anymore and equalised in a free-kick under the wall that Kawashima should have stopped. In fact, the foul leading to the kick should never have been awarded, as Falcao Garcia took Hasebe down just in front of the box and not the other way around. 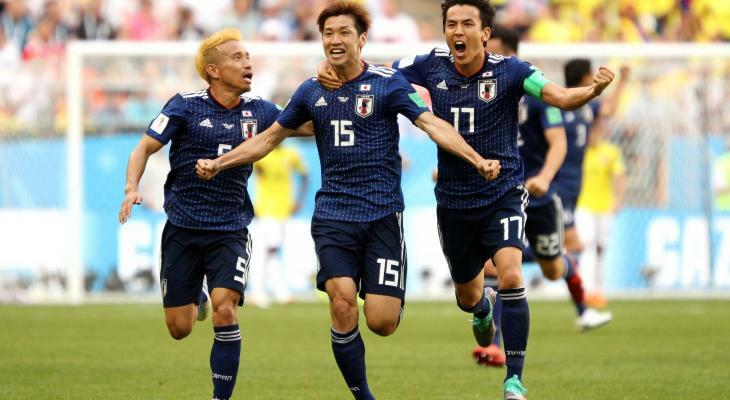 If there was a balance of forces in first half, the Colombians run out of gas in the second half and Japan finally were able to dominate and keep control of the ball. It was a deserved and epic victory and, more importantly, a morale boost that this team needed so much. Japan surprised the world and made it clear that anything can happen in the next two rounds.